Ankara, Ankhs and the Ongoing Appropriation-vs.-Appreciation Argument: Is There a Right Way to Rock African Style? Fun fact: I love African fashion, iconography and decor; always have. I love wax prints (yes, I know they’re actually Dutch/Indonesian), indigo mudcloth, Coptic crosses and Moroccan wedding blankets, and happen to be writing this while sitting under a red Bamiléké feather headdress gifted to me by a godmother who regularly visits the continent. I was born into that generation of children given African names by newly “woke” parents (mine borrowed from the title of a Miles Davis song). And I may have rocked an African medallion in the early ’90s, and head wraps well before Erykah Badu dropped her debut single. That said, it’s 2017, and I have no intention of attending a kinara-lighting ceremony looking like I’m wearing a Kwanzaa costume. I’m also not immune to the argument that there’s a measure of appropriation in the way many of us approach wearing African fashion, as posited in 2015 by writer Zipporah Gene. Donning dashikis, rejecting straightened hair, and taking on Afrocentric names directly originated from the “black is beautiful” movement, which promoted black self-love. Embracing an African aesthetic during this period required courage, considering that in the recent past black students were discouraged from wearing bright colors, let alone African dress. Did you know you can buy Ankara-printed dresses on Amazon.com for under $50? Of course, you could also spend several hundreds more, and buy them from English designer and Beatle progeny Stella McCartney, who was taken to task this fall for using African prints (and a noticeable lack of African models) in her Spring 2018 collection. Needless to say, there are better ways to get the look while supporting designers of the African Diaspora: Think less Stella McCartney, more Stella Jean—or Nigerian-born Duro Olowu. 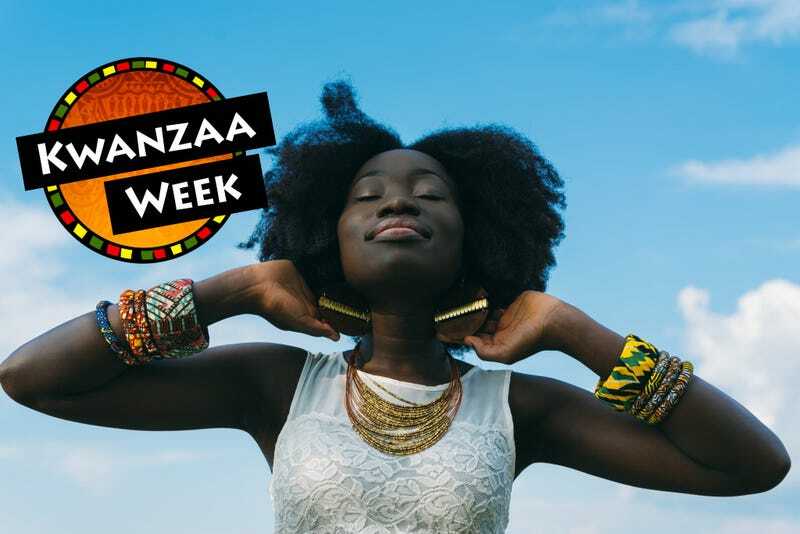 I personally love to support African designers by hitting African-owned Etsy and pop-up shops, like the many thrown by online marketplace Zuvaa this past year. A recent new find at one of these events? Benin-born designer Eldior Sodeck, whose Ankara-patterned silhouettes range from traditional to Afrofuturist, with nods to athleisure and Japanese kimonos. With such a wealth of beautiful African goods out there, it’s tempting to pile it all on—but just because you can doesn’t mean you should. You don’t need to make a statement. African fashions are so striking, it’s generally ideal to pick one item or category—a bag or a blouse or an armful of bracelets (not all at once)—and let that speak for itself. Besides, Africa is an entire continent, which means that putting too many elements together can actually be culturally confusing. Since Kwanzaa is an African-American holiday, it’s only fair to remind you that there are plenty of African-American designers doing the damn thing—and evoking African styles and silhouettes in the process. Not sure where to start? Check out Demestik by Reuben Reuel or Onion Cut & Sewn by Whitney Mero. Feeling creative? Brooklyn, N.Y.-based home-design brand AphroChic sells its culturally evocative patterns by the yard. Do you know where the Ankara print originated, and how it evolved? How about the centuries of religious history behind the Coptic cross? Have you ever unraveled the complicated history of head wraps? American blacks saw a parallel between Africa’s struggle for independence and their own struggle for equal rights in the United States. Their interest in African fashion never stemmed from a desire to rip off African peoples and popularize their customs for profit, as is often the case with cultural appropriation. It stemmed from the desire to carve out a new racial identity in a nation that had not only treated them as sub-humans, but also taught them to buy into damaging stereotypes about their ancestral homeland, further instilling in them a sense of inferiority. For Liberian-born designer Abiosé Decontée Massaquoi of Fiend List, the feeling is entirely mutual. If that’s not appreciation, I don’t know what is.